From ancient Indians, Celts, and Christians – Boo! Halloween’s witching season is just around the next dark corner, as we peruse the discounted, mondo bags of candy in the stores, trying to ignore their enchanting aroma. Much of Halloween’s mystique is fueled by folklore – which brings me to one of my Words With Friends entries to lead off the ghostly season. MANITOU (manʹɘ tōōʹ; also manitu or manito): n. Folklore among the Algonquin Indians, any of various spirits or supernatural forces variously conceived of as nature spirits of both good and evil influence. Spirits have influenced our cultures since the beginning of societies. The advent of storytelling fueled mesmerizing tales of life after death and exploration of the supernatural – and we still don’t know what, if any, is “real.” What should we believe? Halloween capitalizes on stories that have flowed through the blood of our ancestors to thrill, excite, revere, bewilder, and scare, for centuries. So for the next six weeks, let’s don our masks and lurk behind the door to learn what Halloween is … beyond gaining five pounds in chocolate, and images of Freddy Krueger. Whether you have young children and still celebrate this convoluted holiday with ghoulish costumes and pillowcases full of candy, or enjoy adult-style masquerade partying, we can’t ignore Halloween’s historical and spiritual significance. Manitou is a light introduction to the spirit world, as some Algonquin traditions define it as a Great Spirit or Supreme Being – in Christian terms, god or gods. Yet, there are stories of evil spirits in their midst, as well. With many Algonquians in Quebec, the balance of more than eight thousand are spread from Virginia to the Rocky Mountains, venturing north to the Hudson Bay. In their society the shaman is a powerful force and practices a form of tribal witchcraft. Doesn’t sound so far removed from many of the tales that surround Halloween, does it? Referring to my earlier comment, Halloween is, as are many holidays, convoluted in its origins and celebrated or denigrated in many different ways. Numerous countries and cultures integrate spirits, either religiously or menacingly in various forms, during this alternately reverent and malevolent time of year. Popular belief steeps its beginnings in a desire to convert the Irish / Celtic traditions honored in Samhain harvest festivals, to acceptable Christian Church* practices. 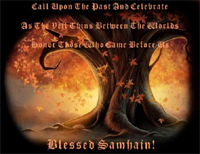 Spiritual observances and celebrations, known as Allhallowtide, runs from sunset on October 31st to sunset November 1st. More history next week as we celebrate the weird words of Halloween and its spirit world. May the Manitou tread lightly on your soul. 'Til next time ... don’t get spooked and have a "wordful" week! * Interestingly, in a search of “Christian Church” and Halloween, I found only warnings not to participate in its celebrations or festivities, “… Halloween has strong roots in paganism and is closely connected with worship of the Enemy of this world, Satan.” Hmmmmm, yet supposedly, Halloween was created in the modern world to conform to Christianity ….